The American corporation has been transformed by globalization and new technology. But equally powerful is the belief on Wall Street and in boardrooms that the sole responsibility of a corporation is to maximise profits for shareholders. As part of our ongoing series “The Price of Profits,” we took a look at IBM, a company that for years refused to lay off workers, and then had to rethink its corporate strategy. Monday evening marked the most important moment so far in the run-up to the June 23 referendum on whether Britain will leave the European Union, with new polling showing a lead for the “Leave” campaign and the widely read newspaper The Sun endorsing that campaign. would open Pandora’s box” in Europe — is the largest it has ever been. Brevan Howard, one of the world’s biggest hedge funds, is said to be preparing itself in case more investors withdraw funds. A rule has been broken on Wall Street, and ‘any banker with a brain’ is now looking for an exit. Investors are sending a strong signal that they’re tired of takeovers. Someone just lost a ton of money on LinkedIn, and the SEC probably has questions. A hedge fund manager made a killing on Microsoft-LinkedIn — here’s what he thinks about the takeover. And here are the bankers who worked on the massive deal. A few random shareholders just made the Valeant CEO sound stumped in less than 20 minutes. ‘Incremental’: What Wall Street is saying about Apple’s underwhelming big event — The general sentiment on Wall Street is that Apple’s annual Worldwide Developers Conference event in San Francisco on Monday was not groundbreaking. Goldman Sachs has been accused of hiring prostitutes to win business in Libya — Goldman Sachs hired prostitutes to win business from Libya’s sovereign wealth fund, established by late-dictator Muammar Gaddafi, a UK court has been told. Here’s what private-equity billionaire Henry Kravis learned from losing a deal to Warren Buffett — Kravis has learned a thing or two from Warren Buffett. Deutsche Bank’s Asia chief is leaving — Deutsche Bank’s Asia Pacific chief executive officer Gunit Chadha has decided to step down from his role at the German lender, effective July 17. Investors haven’t hoarded cash like this in 15 years — There’s a lot to be nervous about in the investing world right now. Here’s the bizarre reason Fed statements became a whole lot easier to read in 2002 — Occasionally, a seemingly bizarre question has a simple answer. Inflation is getting out of control in Africa’s largest economy — Africa’s largest economy is failing to keep inflation under control. Here are some mind-blowing facts about the ads in Times Square — The ads in Times Square are known as an attraction for the millions of tourists who visit New York City each year. 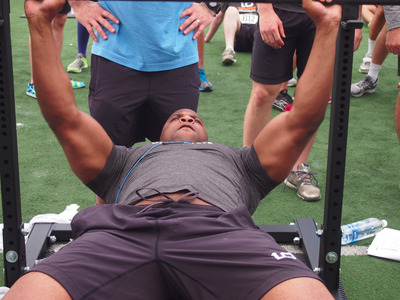 Inside the intense event that decides ‘Wall Street’s Best Athlete’ — The fittest men and women on Wall Street competed for the crown of “Wall Street’s Best Athlete’ on Sunday June 12.